The starry night sky on the left, the colorful dawn sky in the right, along with the popular Portland Head Lighthouse and the dreamy ocean water all combine to form a beautiful composition. The image is a result of stacking multiple exposures and then masking out selected regions in Photoshop. “I woke up around 4am to head over to Portland Head Lighthouse. I wanted to capture a ‘night to day’ type photograph, unfortunately the skies were not cooperating too well. I definitely want to go back on a clear night to make another attempt, but I’m still pleased how this image turned out. Nikon D810 14-24 at 19mm F11 ISO 64 Shutter 6 images that varied between 2 – 4 minutes and then stack. 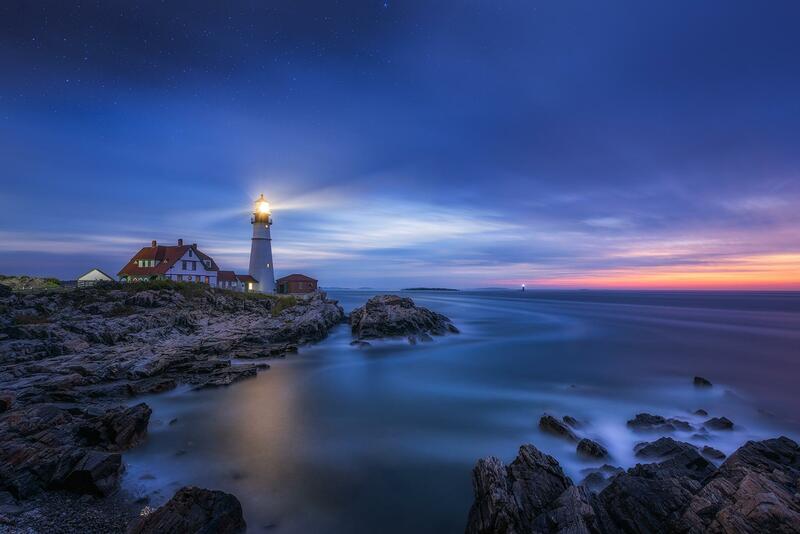 The Portland Head Lighthouse is one of the most photographed lighthouses in the US. But that doesn’t make this image any less amazing!